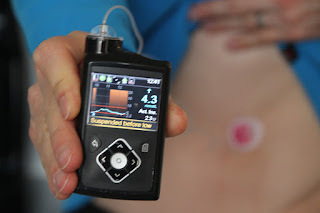 I'm now connected to a new pump, the Medtronic 640G. And here's the disclaimer: I signed a blogger contract with Medtronic. Signing the contract was not really required of me to get the pump. I have discussed my need for a new pump with my doctor, and she has indicated I have a choice between the three pumps they can offer: the Accu-Chek Spirit Combo, Animas Vibe, or the Medtronic 640G. However, I wasn't sure which pump I'd prefer. So I asked Medtronic whether they could provide me with a sample so I could get to try it in real life. They said the easiest way would be to get it under the blogger contract, which actually sounded good to me, since I've felt I should be more active with this blog. Now there would be a reason to write a post every once in a while. So you may consider any upcoming posts about the Medtronic 640G as advertisement, if you wish. However, I'll do my best to record both the good and the bad experiences.